This week's entry concerns the Flintstones and the wonderful organization known as the Loyal Order of Water Buffaloes Lodge. In the Flintstones, Fred and Barney (who were modeled after the television program, the Honeymooners) are members of two societies that seems to be fashioned after a mix of the Freemasons, the Shrine, the Elks and the Moose: the Water Buffaloes and the Order of Dinosaurs. The Loyal Order of Dinosaurs was the precursor to the later group known as the Water Buffaloes. (Ironically, the Elks may have been named the Buffalo had the votes been different.) Water Buffaloes are led by a man known as the Grand Poobah and meet in Lodges. The brothers have wild parties and is strictly restricted to men. Fred and Barney are members of the Loyal Order of Water Buffaloes Lodge No. 26. Although there appears to be more in common with the Elks or the Moose, such as the fact that alcohol is freely consumed and that the brothers of the Water Buffaloes have stag parties, there are still some similarity to Freemasonry and the Shrine. There is a s ecret phrase to gain admission: Ack, Ack, A-dak. The Grand Poobah is also sometimes referred to as the Grand Imperial Poobah just as the leader of the Shrine is known as the Grand Imperial Potentate. As a side note, the name of Grand Poobah originally comes from the Gilbert and Sullivan musical, "The Mikado" where the Grand Pooh-bah is a man that holds many exalted titles that meant absolutely nothing. Even today, the title of Grand Pooh-bah is a lampoon on anyone who seeks great prestige with meaningless jobs. However, in all, Freemasonry does not appear to feature as prominently a part as other fraternal organizations. It seems that the joke is directed, fairly or unfairly, to the Shrine, the Elks and the Moose who attended heavy drinking parties and saw as the episode I have posted, dancing girls and "cactus juice". Freemasonry does not, in and of itself, promote the idea of heavy drinking and raucous fun; the Shrine provides those opportunities for men to have "fun". During the Fifties, Freemasonry experienced a boom time as well as many other fraternal organizations when former members of the military kept in contact with their friends in the military after both the Second World War and the Korean War. Almost five million men joined Freemasonry and the Lodges truly flourished. 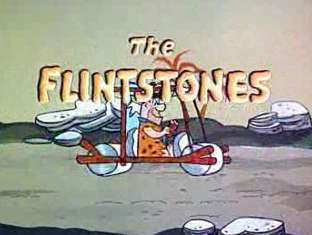 Although "the Flintstones" was created between 1960 and 1965, many of the ideas that were presented in the show were in fact from the 1950's. The turbulent era of the Sixties had not yet come to complete fruition as the United States did not come to grips with the Viet Nam War until much later on in the decade. "The Flintstones" are examples of the what the 1950's ideals meant in the United States. If you would like to see more from "the Flintstones", visit http://video.aol.com/video-category/the-flintstones/103140. 300 years ago, lodges were meeting in taverns. Table lodges and "festive boards" were de rigeur for most of our brethren. The painter William Hogarth (a brother) in the early 1700s had a fascinating satire on such antics with his painting "Night." Certainly today the Blue Lodges don't promote the idea of raucous fun, but I believe that this is a reaction to some of the fallout from the Morgan affair in the 1800s and the increase in the number of independent fundamentalist churches in the central and southern US, which colored the communities themselves. True, but I was referring more to Modern Freemasonry with its incredibly restrictive beliefs concerning alcohol in the Lodge. The reason behind the creation of Shrine was that Lodges got incredible nervous about alcohol during the temperance movement. I actually just checked Paul Bessel's site and it appears that Conn. can do what ever they want with booze which is very different than most other jurisdictions. I posted earlier about alcohol ( http://www.millennialfreemason.com/2008/06/alcohol-and-lodge-do-they-mix.html ) and it seems that even during the Fifties, if you wanted to go to soirees and other functions, at least in the States, you needed to join Shrine. It is true that Lodges met in Taverns but as Lodge buildings were being constructed, the Fraternity changed until others decided that there needed to be a change and bring back the booze by going to Shrine. Tom, those Lodges 300 years ago promoted neither heavy drinking nor raucous fun. Members were fined for boozing it up and could be suspended if found drunk in public (or so say some 200-plus-year-old minutes I've seen). While many (in the U.S.) attribute the Morgan Affair with the strict attitudes toward alcohol, it started happening before that. I'd have dig out an AQC paper on Dunckerley I've got, but the premise was that he was the one who pushed for meetings in the late 18th century to be more intellectual in content and less convivial (i.e. like a table Lodge). This resulted in a revision of floorwork for degrees (since no table was in the middle of the room any more). I'd be interested to learn when the first dedicated Masonic Hall was built in the U.S.
Justa, I certainly didn't make imply that our older brethren promoted drunken orgies; however, I can't believe that groups holding meetings over local taverns (as did my own lodge) were devoid of high-spiritedness, possibly fueled by local spirits. And MM, Conn is an interesting state compared to many others - Masonically speaking. There is a lot more control at the local lodge level, which leads to some interesting differences between lodges in different parts of the state.